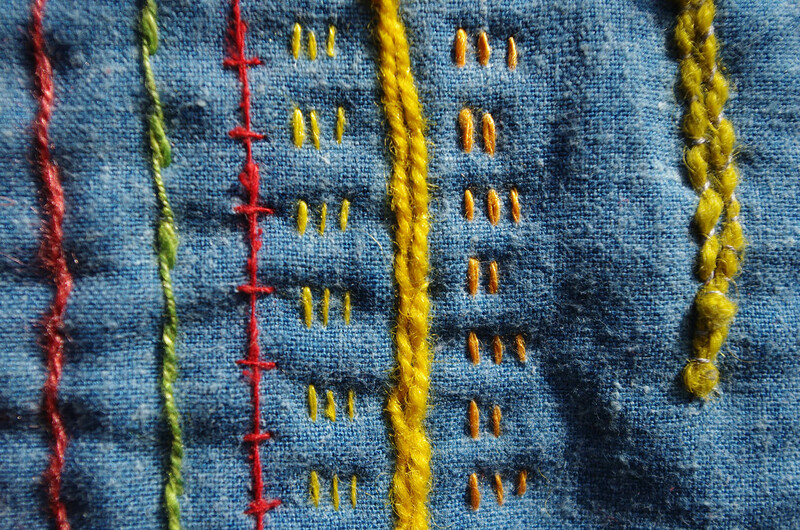 I am passionate about working with cloth and yarn dyed from plants you have grown yourself. I gave a talk yesterday to the Chelmsford Embroiderers’ Guild. I had a lovely evening. Thanks to Angela and June for inviting me and for your hospitality. Fiery Felts I forgot to mention this supplier in the talk but Helen is very good for dyes especially dried flowers hard to obtain elsewhere. Her booklet on indigo is also excellent. Mulberry Dyer run by Debbie Bamford, a pre-eminent historical dyer who sells at re-enactor markets and also via etsy shop. 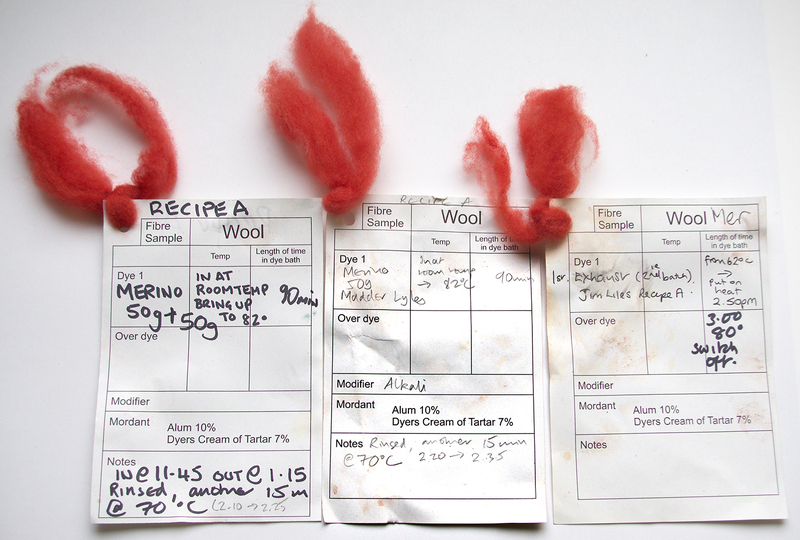 Jenny Dean Doyenne of Natural dyeing in UK. Her landmark book is Wild Colour (2010) but all her books are excellent. This entry was posted in growing dye plants, history of dyeplants, learning to use dye plants, stitched textiles, talks, Uncategorised and tagged Plant dye talk, Plant dyes for embroidery on 20th February 2018 by susan dye. 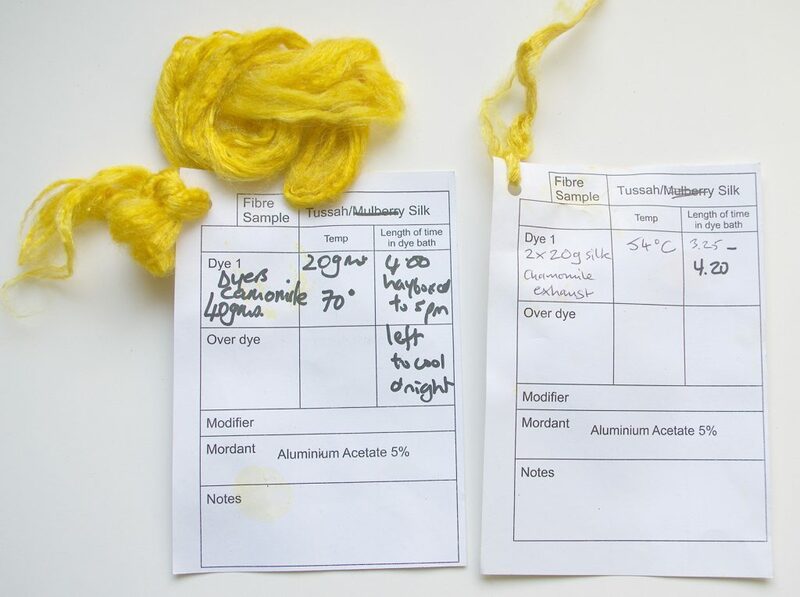 In January two years ago I ran a plant dye workshop for Region 5 of the International Feltmakers Association. One thing leads to another and … by way of the IFA AGM last Spring, I was invited to run a similar workshop this January for the Region 7. And what a delight it was! Thank you to Sally Sparrow for organising the event. With my friend Brian’s most excellent vehicle (I don’t run a car), and not a little anxiety as to whether I had packed everything we needed, we installed my dye studio in a scout hall in the outskirts of Ipswich for the weekend. The venue was large and well appointed with power sockets for my preferred heat sources – portable electric induction heaters (you can see them in the background in the picture above). By the end of the weekend nine enthusiastic participants had applied a good palette of natural colour onto nearly 2kg of pre-mordanted fine wool and silk. If you would like to know more and see some great photos, check out Kim’s blog at flextiles here and here. Kudos to Kim, for the excellent write up! We used home grown madder for pinks and reds, home grown weld for acid yellow and for blue we used bought in woad powder and natural indigo (because at this time of year you can’t use fresh leaf). We also added in some oranges from dyer’s coreopsis and warm yellows from dyer’s chamomile, both from stock of our home grown, dried flowers. Here are just some of the colours we obtained. My aim was for people to get lots of hands on experience working with the dyebaths, to be free to spend most time on the colours that most interested them and get some theory and tips on good practice. I also like to make sure everyone goes home with enough fibre to use in a project. And finally, because I can’t resist the technical detail, there are handouts to read later. The workshop couldn’t have run without my two helpers. My partner Ashley ran the indigo vats at one end of the room while I set up madder and weld dye pots at the other. Brian Bond, a longstanding friend and collaborator, was invaluable as all round helper. For inspiration, Brian brought along his glorious plant dyed and hand spun yarn and knitted garments to display. Ashley brought his current work in progress – darned squares of which he needs to make 144 to complete a blanket. And I set out my collection of fabric and thread samples. 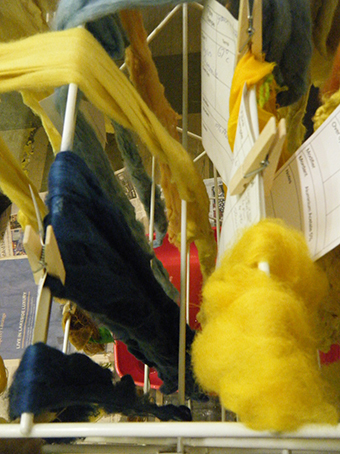 This kind of workshop has long been a regular feature of my local Spinners Dyers and Weavers Guild. We usually hold these events outdoors on a long summer’s day which works really well for rinsing and drying. I’m looking forward to running the next plant dyeing day for the North Herts Guild of Spinners Dyers and Weavers on Saturday 26 May 2018. 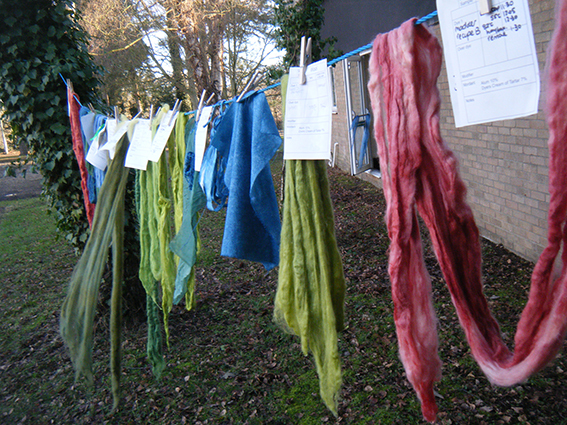 Contact me if you are interested in hosting a plant dyeing workshop. I am open to designing events to suit specialist audiences. Note on blue: We were using a combination of commercially produced woad powder and natural indigo. To save time at the workshop, these were made up into separate pre-reduced stock solutions. We discovered that the woad powder was considerably less concentrated than the natural indigo. As a result the woad stock solution was over-reduced. The natural indigo produced some very dark blues (see below). 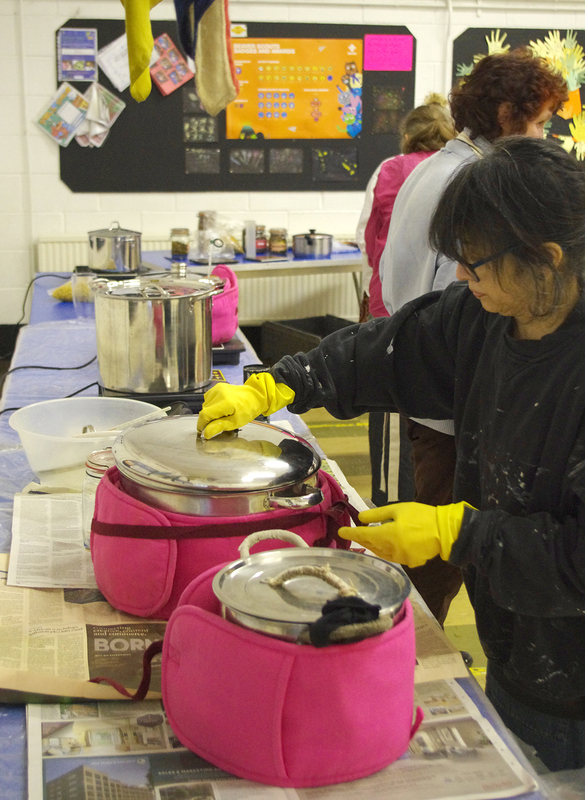 Whereas the woad vat was over-reduced and it wasn’t possible to apply a deep colour, no matter how many dips we did. We plan to do a controlled experiment comparing the strength of different commercially available woad powders – so check back for more details. 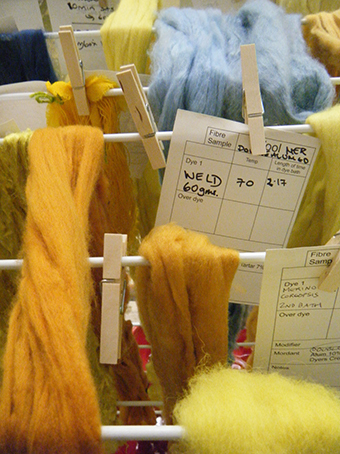 This entry was posted in Colour in Winter 2, Uncategorised, workshops and tagged Common Madder, Indigo dyeing, Natural dyeing, plant dye workshop, plant dyeing for feltmakers, Weld, Woad on 20th February 2018 by susan dye.